Joy’s House proudly offers adult day services at two locations and support services to family caregivers caring for an aging or disabled loved one, regardless of their affiliation with Joy’s House. These services provide opportunities for organizations like yours to reach those families served directly by Joy’s House as well as to connect in meaningful and supportive ways with other family caregivers and stakeholders throughout the Central Indiana community. We view sponsorships as an opportunity to partner with you with a goal of serving more people, expanding exposure, sharing resources and deepening our relationship. 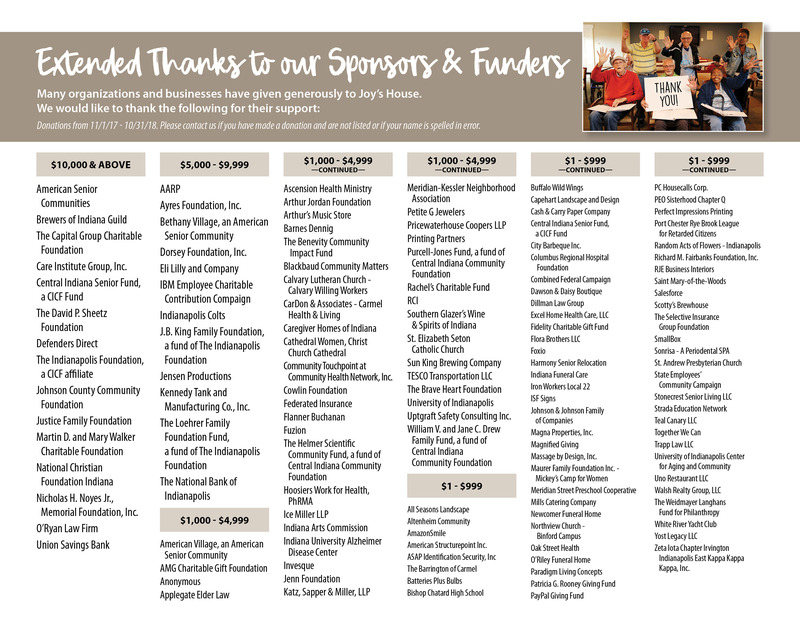 Corporate sponsorship opportunities are available for our Adult Day Services, Caregiver Support Services and Fundraising Events. If you are interested in learning more, please contact Susan Hinshaw today.